Coffee choices are everywhere here in Saigon. No matter if I want a traditional Vietnamese iced coffee served in a tall glass with condensed milk and an iced tea spoon or whether I want a Western version of cappuccino with the foamed milk on top I can pretty much get a cup of coffee anywhere. We even make coffee in the mornings in our residence at Compass Parkview. But for this I need freshly ground coffee beans. Billy and I discovered several shops that sell coffee beans and tea, and I purchased 500 grams of Arabica beans for 175,000 dong or $8.22 for 1.1 pound of coffee. Since we drink coffee every day, I soon needed to replace my supply. However since I was shopping on a Sunday, my favorite coffee shop was closed. So I made a visit to my neighborhood Starbucks coffee shop to purchase beans. 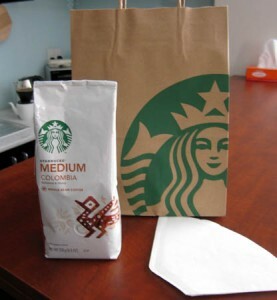 I purchased 250 grams of Columbia coffee for 200,000 dong or $18.80 for 1.1 pound of coffee! Even though I enjoy the Starbucks brands of coffee, I think I will stick with my favorite local brand! This entry was posted in Travel Tips and Insight and tagged daily life, Travel. Bookmark the permalink.